I have a confession: I’m the kind of person who likes to visit places other people usually don’t say good things about. I don’t know why, but I feel an odd necessity to visit these places to show that people are wrong. And that’s what happened with me and you. I’m sorry, but it is true: Your reputation is not the best . But I’m writing so that others may realize how interesting you are. We became neighbors last November as I moved to the other side of the Detroit River. I’d see your skyline from almost anyplace I stood in Windsor. It’s funny to live on a border, to check out another country on any random day. And yet the day I first decided to visit you was not the most opportune: A cold January Monday, when most of the museums are closed. But it was still easy to discover the beautiful things you can show. 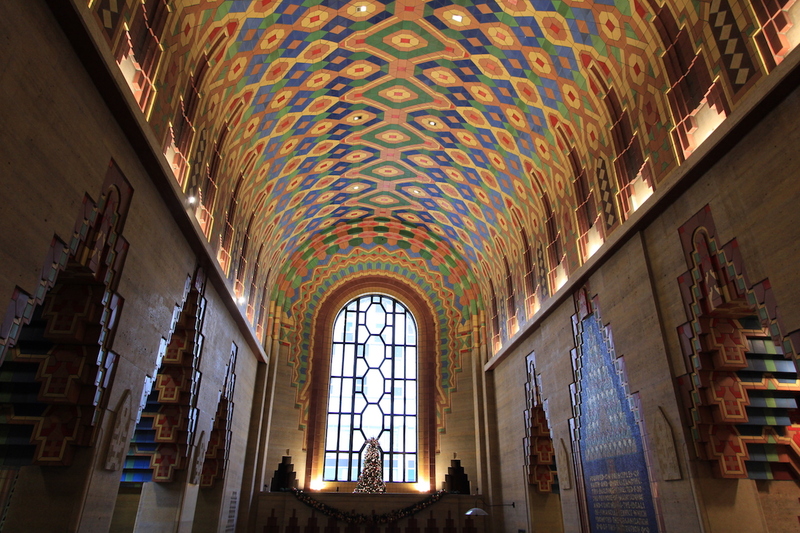 I stopped in the Guardian Building and was impressed by its Aztec-inspired structure. 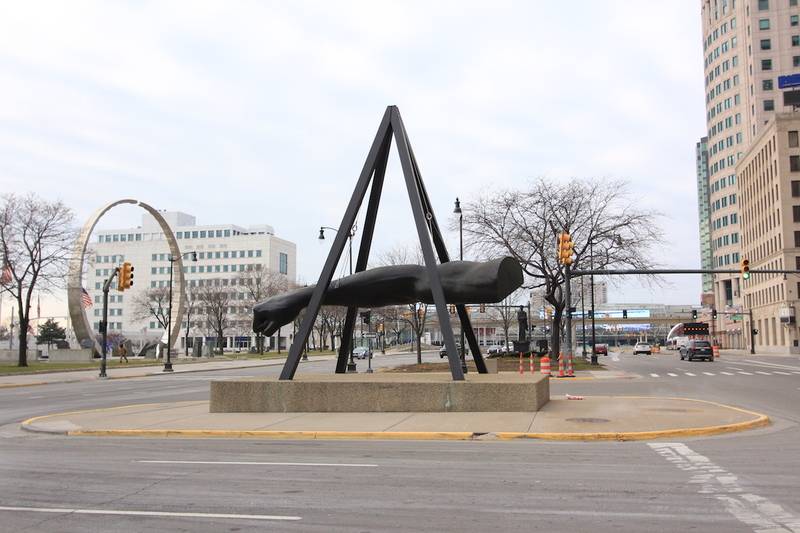 I discovered how Woodward Ave leads me through other districts. I stopped along the riverside (although I confess it was so could that I just stopped to take a picture). I will be back for a long walk. Leaving the river and following Woodward Ave I found more surprises. 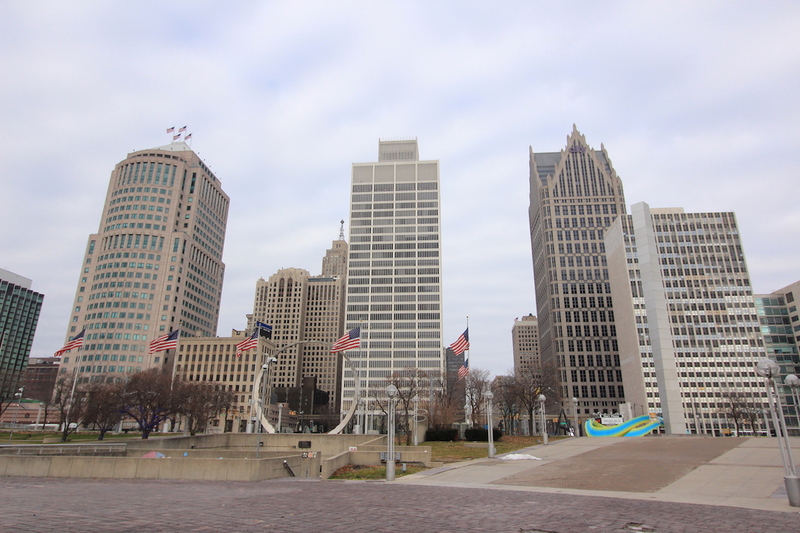 The Wayne County building stood out in the middle of the city with the roman baroque style. Next was Harmonie Park. I didn’t know it was a jazz place from 1920s to 1950s, I had to read a guide to get this information. And guess what? I could feel the vibe once I saw the Music Hall Center right across Gem & Century Theaters, I’ve already made a note to catch a presentation in the Musical Hall. The Casino from Greektown was packed when I stopped at Astoria Pastry Shop to grab a treat for myself. It was here that I realized the buildings have speakers on it so people on the street can listen. Nice, Detroit. I must say I liked it. Following Woodward I got to the Theater District. I think we have to thank Mr. Mike Ilitch — owner of Little Caesars Pizza, Detroit Tigers baseball, and Detroit Red Wings hockey teams — to renovate the Fox Theater. I could add details about the Detroit Institute of Art as the International Institute of Metropolitan Detroit or the Detroit Historical Museum but I’ll leave this for readers to check on the internet. I’ll tell you a secret: I love to eat and want to discover more about Mexicantown and Eastern Market. I think I have a lot to learn from them. I can’t believe I have written so many words without mentioning the importance of the automotive industries to you. I apologize for that. Henry Ford transformed the city forever, and the known “Big Three” (Ford, General Motors, and Chrysler) changed you. You should be proud. The world has changed in your land, history was made. Even though the 2008 crisis tried to show differently, the motto you used on the fire of 1805 “Speramus meliora; resurgent cineribus” should be remembered after 2008 as it translates “We hope for the better things. It will rise from the ashes”. You believe it, so do your people. I feel sorry for tourists who do not try to get to know you, to discover your soul. They would see many things to do and discover if only they gave you a chance.